Sachin retired….. on his own special terms in a grand manner … and that walk to 22 yards and his bending down to touch the ground were immortalized. When Sachin played his historical 200th test, another player not so popular but equally committed achieved a grand feat – that 150 tests in the same match….. that was Shivenarine Chanderpaul. On Sachin’s farewell, camera focussed on young Arjun Tendulkar too…. 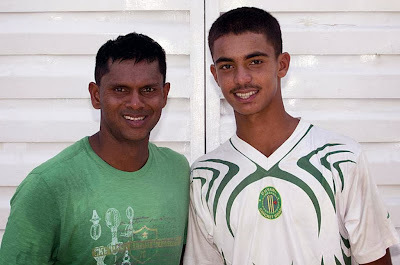 what Sachin could not … Shivnarine has achieved !!!!! The chubby Arjun Tendulkar is 14 and making a decent name for himself as a batsman in the Mumbai junior leagues… on that day Sachin said - “As a father, I will say leave Arjun Tendulkar alone” – he pleaded to the media to let Arjun enjoy the cricket, and not burden him with expectations. Sachin was to say humourously ‘If I had such pressure on me, I would have ended up with a pen in my hands because my father was a literature professor.’ In less than 24 hours from bidding adieu to International cricket, Sachin was to say this of his son who reportedly is also madly in love with cricket. After his retirement also, press followed him stating that the next day - Tendulkar laughed about waking up at 6.50am, showering quickly, ready to rush down to the ground, when it suddenly dawned that for the first time in a quarter of a century he need not bother. So he made a cup of tea for himself, relaxed, dined with his wife and thought of nothing else. Just a day earlier, he had received a call from the Prime Minister of the Nation to inform him of the special moment of his being conferred the nation’s ‘Jewel of India’ honour. Tendulkar, adamant that he left cricket at the perfect time and without a single regret, dedicated the award to his mum Rajni and the “millions and millions of mothers in India who, like her, sacrifice thousands of things for their children. I would like to share this award with all of them”. Sachin and his exploits would ever be remembered by all of us who were mesmerized by his batting. Tagenarine made his debut as an opener for Guyana, captained by spinner Veerasammy Permaul. That may not matter much until you read his full name of Chanderpaul yes, son of illustrious father. Shivnarine Chanderpaul has proved to be dodgy and difficult to dismiss customer for most International bowlers. Born in Aug 1974, this lefie has made 11040 runs in 151 Tests (257 innings) and when you add them to 8778 one day runs in 268 matches / 251 innings they sound too impressive. He has 39 International hundreds in all. He never seems to play in the V, or off the front foot, but uses soft hands, canny deflections, and a whiplash pull-shot to maintain a Test average of around 50. Throughout his career, he has managed to keep his own standards at a remarkably high level despite the perennial problems that West Indies have faced. A stint as West Indies captain followed in 2005-06, and though he celebrated with a double-century in front of his home fans in Guyana, it was clear that captaincy was affecting his batting, and in 2006 he gave it up to concentrate on his main job. His greatest contribution, though, has been in holding together West Indies' fragile batting line-up after Lara's retirement. While things have crumbled all around him in West Indies cricket, Shivnarine Chanderpaul has managed to not only maintain his standards but also raised the bar consistently throughout a career that has already lasted almost 20 years and shows no sign of ending. The Mumbai Test is his 150th, placed him in a select group of seven who've played that many Tests. The price that he puts on his wicket has always been high and has scored against all. No bowler has dismissed him more than seven times; Anil Kumble has got him out most often with seven, while Kallis, Angus Fraser and Danish Kaneria have dismissed him six times each.